A little Bat Music anyone? Meanwhile, let’s look at some of the amazing creatures that inhabit Willow’s world: BATS. They are the only flying mammals in the natural world; some bats are as miniscule as a bumble bee, others boast wingspans of more than 1.5 metres. Its most ancient contingent, the micro bats, prey mostly on insects in our gardens and meadows. However, a more recently evolved mega bat species prefers to munch on juicy fruits such as figs. They are not dangerous, but play an important role in the delicate ecosystems of tropical landscapes, where they pollinate plants, spreading seeds as they plant after plant to feed. The earliest bat fossils date back to nearly 60 million years ago, when Earth’s temperatures gradually increased, insects thrived in their billions, providing a staple supply of food for bats. The bat fossils demonstrate that these mammals had already learned how to fly. Bats use high-frequency sonar to hunt their insect prey. Scientists have so far identified more than 1,000 types of bats, which works out to an astonishing 20% of all mammal species. While bats cannot really be called “musical”, they do produce their own type of music. Some species of bats produce continuous tones with varying notes. Other bats produce sounds where the tone modulates. Some bat species can even produce sounds as a harmonic chord. Our human ear can only capture sounds up to 20,000 hertz, but bats can produce “music” of 14,000 to 100,000 hertz, which they use to hunt in the dark. Their pitched shrieks help them to determine their whereabouts in the pitch black night and how far away they are to solid objects. The delay in time and pitch changes signal to bats where they are within an open space. Bats use their sounds to create a mental image of the world in the dark without the need for sight. Their sound making ability is called echolocation. Bats are one of nature’s most powerful predators of insects, reducing insect populations in many parts of the world, where nature would otherwise be overwhelmed by an ever increasing insect world. 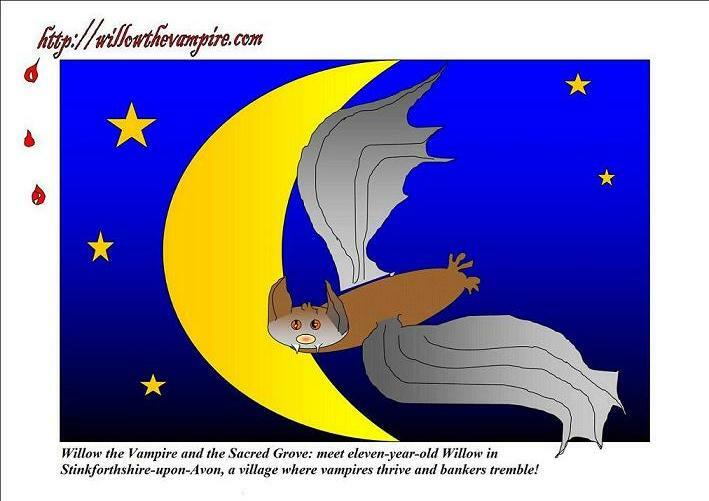 In Willow the Vampire and the Sacred Grove bats are not always friendly, since older vampires have the skill to turn themselves into a variety of nocturnal animals. In nature, however, bats are typically harmless and shy creatures, threatened by extinction due to our reckless destruction of their habitats.